DUKE Heights Business Improvement Area is an employment focussed BIA. As a part of the economic development strategy for this area, we are working with businesses and other local service providers to develop a sector-specific workforce model to strengthen business-labor relationships in the BIA, attract well-trained talent pool, and support businesses to enhance their sustainability and productivity. The DUKE Heights BIA largely comprises of manufacturing-based businesses. 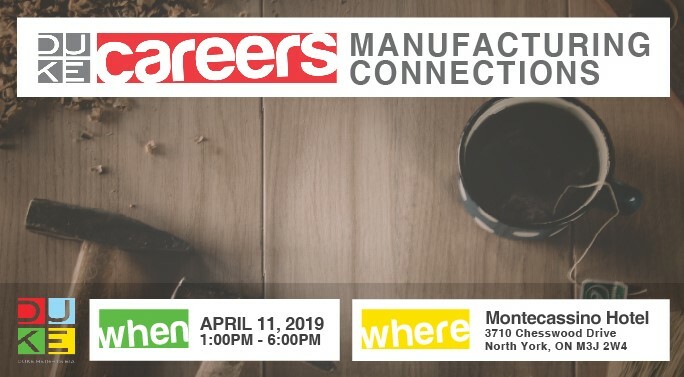 To this end, DUKE Heights is hosting a first of its kind industry and education engagement event called ‘DUKE Careers: Manufacturing Connections’ on April 11th ‘19. This event is for our businesses, job seekers, employment agency partners and industry professionals to discuss how to improve career prospects and to introduce exciting innovations in the food and furniture manufacturing industry. Our goal is to dispel employment myths, generate solutions for ongoing attraction and retention issues, and promote a better understanding of career development opportunities in the evolving manufacturing industry. The event will include panel discussion, working group sessions, followed by a lively session of networking where potential job seekers will get the opportunity of one-on-one interaction with the businesses and industry professionals. The objective is to promote localized employment opportunities by creating a connection between the manufacturing industry and the emerging workforce. Register for FREE at: dhbia.eventbrite.ca.